10% of the proceeds from the sale of this work benefits PT Day of Service. empowering our members to achieve greatness in therapy practice. I am a marketing person at heart and I have been in sales in one form or another my whole life. As a result, I have a soft spot for the marketing and sales people because they are my tribe. I know from personal experience the demons that these professionals battle every day to move a brand and a business forward. When the rest of the world was pulling back from marketing during the Depression, companies like Proctor & Gamble and Johnson & Johnson knew that they had to batten down the hatches and put more money into marketing while the bottom was literally falling out of the markets. Smart companies know that brilliant marketing minds as well as strategic, directed and hungry sales people are a big part of their secret sauce. This being the case, there is a ton of pressure on marketing and sales personnel to produce and that pressure is not for wimps. Managing one’s head space and keeping your eye on the ball is a full time, serious commitment because we know that jobs and all the lives those positions touch depend on our activity. Be nice to sales people! Every day they fight this battle of creating something from nothing with a deadline and a quota that is directly related to their success and the success of the company they represent. Shawn, Jake and Adam all impressed me because they exemplified a few characteristics I admire. Firstly, they are all gentlemen and I mean this sincerely. Take a look at their interview and see how they conduct themselves. It is a pleasure to interact with gentlemen don’t you think? Secondly, they all had very deep conviction about who they are, how they operate and their commitment to WebPT’s values and mission. They were not just giving me lip service. It was clear they all drank the WebPT Kool-Aid and were 120% committed to moving the company forward in a meaningful and purposeful way. Finally, they all have hearts for delivering service for all the right reasons. Marketing and sales people are servant leaders at their core. Some people do not get this fact about sales people. Yes, we are quota driven. It is our job to generate revenue so that not only the company thrives and can use their profits for good but we and our families do as well. Being a servant leader is a deeply held value and something all successful sales and marketing people are. We know that when we help people solve a problem we are being of service. The problem that the sales and marketing team solves every day at WebPT is the issue of wasted time. Adam said it best. “PTs heal people and we give PTs more time to heal.” This fundamental fact is what drives all sales at WebPT. Isn’t that refreshing? No wonder the company has grown from two employees in the back of a coffee shop to three hundred plus; and from one member/customer to ten thousand members (users) in less than a decade! With this purpose driving your staff, sales happen! WHAT CAN WE LEARN FROM SHAWN, JAKE & ADAM ABOUT BEING FEARLESS? The people who make up the WebPT workforce truly understand how their role helps heal people because the founder of the company is a healer. Heidi Jennanga was a successful rehabilitation therapist for 15+ years when she developed the idea that would become WebPT. She believes at her core that achieving greatness as a therapist heals and that healing takes time. She understands on a hands-on level how wasted time gets in the way of patient care. Her conviction to create a practical tool for therapists to manufacture time so that they can focus on what they do best is so embedded in how she created the company. Adam Ross, who had only been hired 60 days prior to our interview, said that the reason he signed on was because he saw for himself that same purposeful vision he admired when he started following the company in 2009. Rock star talent and loyal customers are attracted to successful companies who have a truly purposeful mission because they know that passion and vision drive further success. Working hard and putting your feet on the floor every morning knowing that you are working toward something bigger than a paycheck is a great motivator. When we come together for the good, great things happen for all stakeholders. Rehabilitation therapists are an underserved community. They are the afterthought in the healthcare industry. There were no tools at the time that WebPT was developed that spoke to their specific needs. This is the problem that Heidi set out to solve. Serving therapists who desperately need to be part of a community is at the core of the solution. WebPT does not call the therapists business owners who choose their software “clients” “users” or “customers,” they invite them to be a “member” of the WebPT community because they are indeed members of a ten thousand and growing online community. The Marketing and Sales team at Web PT see themselves as the glue that holds that entire relationship together. From the first touch with marketing to the next touch with creating a relationship that leads to a sale; this team performs with high integrity because they know that every action they take in the beginning leads to a successful long-term relationship with a population that desperately needs great service and an exceptional experience so they can do what they do best – heal! As an added benefit, Web PT has found that when underdogs are treated with this kind of genuine care and respect they become fiercely loyal and in turn Raving Fans. WebPT partners with organizations like PT Day of Service whose purpose is to help foster awareness of what service is about as a whole and more specifically, the rehab therapy community. PT Day Service knows that awareness is truly the driver of all progress for the world and the rehab therapy community. Many people do not see the value in physical therapy because they have not been adequately exposed to the truly healing and life changing benefits of rehab therapy. Creating opportunities for WebPT employees and therapists to connect with the community in a compassionate service-oriented way also reminds participants that they are part of a larger community and that the actions that they take every day to move their brands forward have a bigger impact than their personal paychecks and the balance sheet of the company. When we turn the lights on and shed that light on good; more good things become possible. Have you ever noticed that when you smile at a person they smile back? The returned smile has no idea where your smile originated from. An attitude of gratitude and overt happiness is contagious. When a company creates a culture that has an intrinsic need to do the right thing and to celebrate the good; great things happen in the hearts, minds, souls, and bodies of all who are exposed to this phenomenon. Gratitude is truly an inside job for each individual. When many individuals come together with a heart of gratitude; passion is created. In turn, passion is the root of hyper-positive productivity. Gratitude in action allows us to get out of ourselves and become better people. Better people naturally become better employees. Adam who has had the crazy stressful experience of shutting down his own startup company as well as having jumped out of a perfectly good airplane 162 times is the first to say that every great thing he has ever done has been on the other side of fear. Jake added that being able to go where others have not gone before, take calculated risks, and be accountable for mistakes along the way is part of walking through fear. Sean concurred that that once he pushed through his fears; he realized that most of the time the outcome was much better than his fear indicated to him at the onset of his journey. All three gentlemen agree, with a smile on their face and knowing nods to me and one another, that when we push through to the next level, success is inevitable and that the period of time we feel intense fear is temporary. Fear is not a permanent state of affairs, it is just a visitor that we shake hands with, welcome and move past. Thank you so much­­­­­ Shawn, Jake and Adam for being such gentlemen, for taking time out for this interview and for doing your part in making time possible so that therapists can take time to heal! Two hands have roadways for arms handing off a heart shaped alarm clock to another hand. Signifying choosing a caring path, community and team work. On the wrist of the left arm is the Hindu lotus and the cycle of life symbol which, I have tattooed on my own wrist, for me signifying that beauty can be manifested from injury. The lotus blooms at night in the mud. The heart shaped clock is an alarm clock because claims must be paid within a certain time period or they may not get paid at all. The alarm signifies urgency to alleviate pain and to take action. 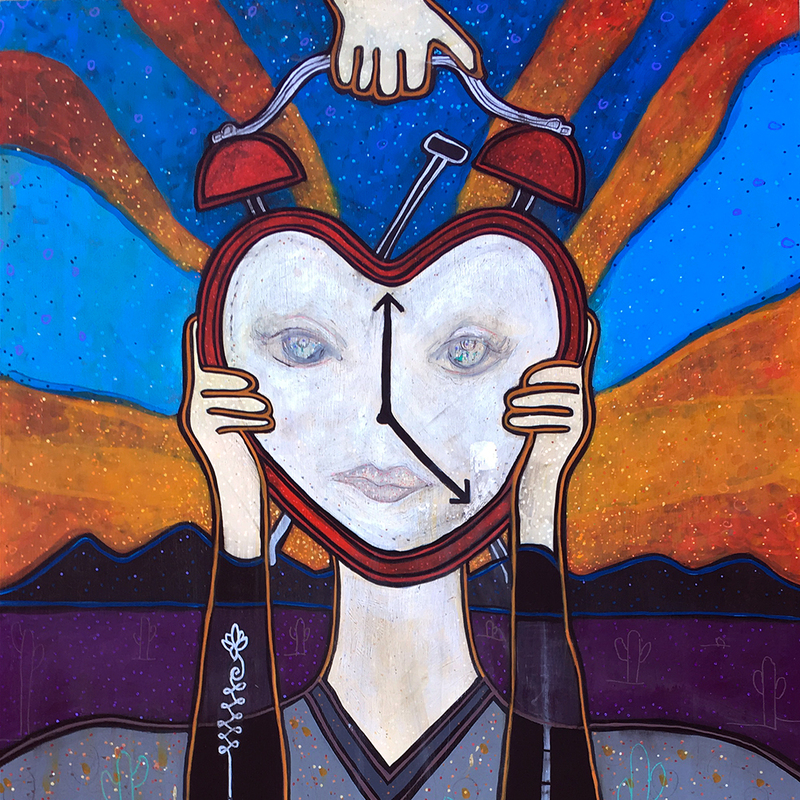 The clock has a face and torso – humanizing the connection of time to healing. The T-shirt is similar to the shirt that WebPT leadership gave me to paint in. Inside the shirt are cactus drawing reference to Arizona. The three muted hands represent the marketing leaders always signify reaching for something better. The Sunset behind the clock is inspired by an actual sunset on the 2nd night I worked on this piece that was texted in awe to me by my friend Robert the very same night I saw it from the road. I wished I could stop on the highway to take an image. When I got to my destination, I discovered he and I were looking at the same sunset view at the same time. This mutual awareness of beauty at the same exact time reminds me that we are always under the same sky and connected. The trails of the planes at Sky Harbor airport created orange stripes across and two toned blue sky. The reference is to both the amazing Arizona Sky which is WebPT’s home and the fact that WebPT is growing nationwide by leaps and bounds. 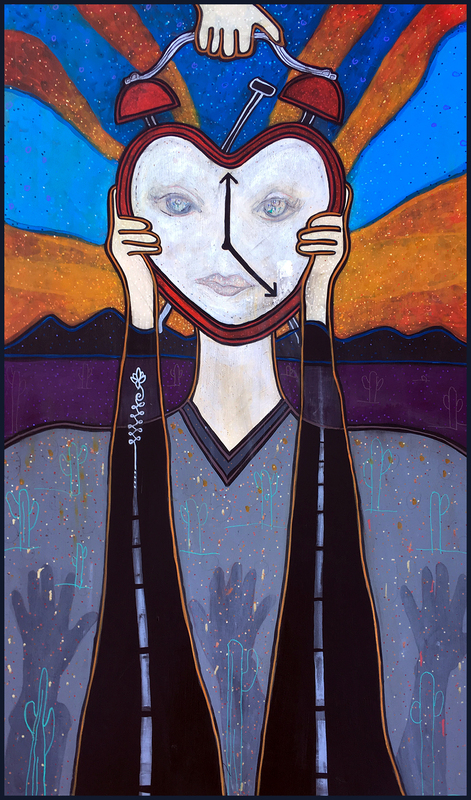 Time is represented in many ways in this piece. Ambiguously time to heal can be one of the reasons people do not value taking the action of physical therapy: Facilitating the sales cycle connecting the first touch of marketing to long term relationship: Marking time with the tenure of employees and members as well as start up to seasoned company.